Ayia Napa is one of the most famous party resorts in the world and undoubtedly the most famous of the Cyprian tourist attractions. Situated at the extreme eastern tip of the island, Ayia Napa has had a reputation for a bustling nightlife and atmosphere for visitors of all ages. Situated in an area of incredible natural beauty, the resort used to be a very family oriented and culture dominated retreat, but the 1990s have transformed the area into one of the party capitals of the world. Despite the young atmosphere, Ayia Napa is still home to a number of Western European expats and some areas of the province continue to provide areas for expat investment in property for sale in Ayia Napa. Ayia Napa occupies a strip of coastline on the eastern tip of Cyprus, stretching for around 20km along the coastline. The resort is found near Cape Greco and south of Famagusta – near to the more family friendly town of Protaras. Travel to the main city of the island, Nicosia, can be made in around an hour by road – whilst Larnaca is 45 minutes away and Limassol 90 minutes. Ayia Napa is serviced by Larnaca Airport, less than 50km from the resort along the A3 national road. Ayia Napa’s beaches are world renowned for having some of the clearest blue water on Cyprus, owing to the Mediterranean coastline and responsible for one of the highest concentrations of water sports in the region. Ayia Napa is entirely dependent upon the tourist industry, with numbers reaching into the hundreds of thousands during peak season. The permanent residents of Ayia Napa number less than 3,000 and many live outside of the resort and commute during the summer. 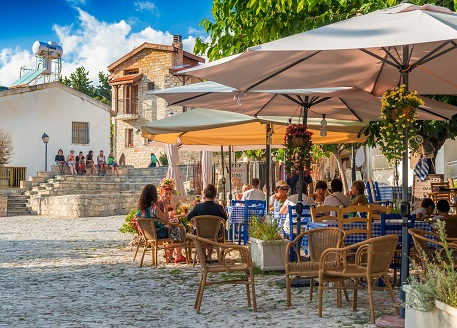 Almost all of the population are Greek or Cypriot, with expats primarily choosing to live in the surrounding towns and villages where life is a little quieter. Hotels and accommodation continue to be erected in the resort every year, with opportunity for investment in properties for sale in Ayia Napa continually rising as the tourism industry booms. Ayia Napa is one of the world’s most visited and most renowned party holiday destinations. Popular for 18th and 21st birthdays, along with Stag and Hen parties – Ayia Napa during the summer is an eclectic mix of British, German, Russian and Eastern European tourists. Despite the outstanding natural beauty and heritage of the region, Ayia Napa continues to be most famous for its wide variety of water sports – along with a thriving nightlife of bars, clubs and pubs. Development along the coast line of the resort continues to boom and shows no sign of slowing down. For more information or if you are interested in purchasing property for sale in Ayia Napa, get in touch with one of our team at Hopwood House today.